Our Summer Stereographer Series this year has a great list of the world's best stereographers and technicians and our goal is to enlighten you about the modern stereographer, his/her role in major tentpole productions, new technology and expert advice for the up and coming new generation of 3D creators. Be sure to check out all our interviews right here. Next on tap for our series is Jeff Amaral who has had his hands in many 3D silos including being a leading Stereographer and 3D Producing Engineer with the 3ality Technica team that made global broadcast history with the first live 3DTV transmissions in 2008-09. He was also Key 3D Engineer and Stereographer: Satellite Unit on THE GREAT GATSBY and Stereographer: Splinter Unit on X-MEN: DAYS OF FUTURE PAST. 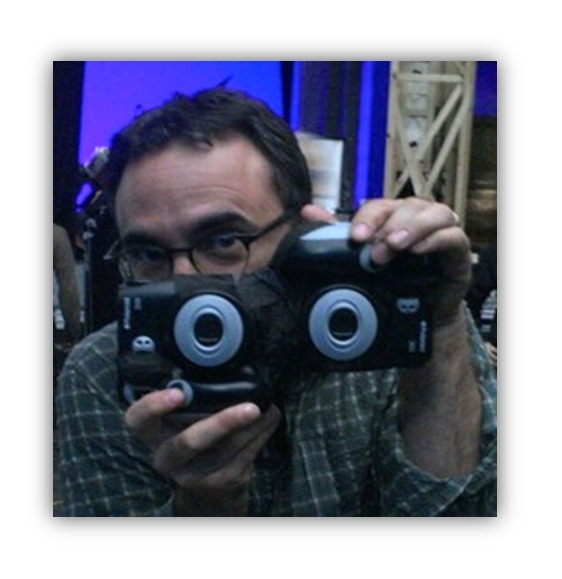 As an avid 3D Filmmaker, Jeff brings both a creative and technical passion to 3D cinema. In addition to over 20 years of feature film production experience, Jeff has been actively working in S3D Cinema since 1999 and he helped create the 2005 IMAX / Playtone documentary MAGNIFICENT DESOLATION for Executive Producer Tom Hanks. After traveling the world to help launch the first live S3D Broadcasts in 5 additional countries, Jeff has created compelling S3D imagery for numerous live music, sports, television, and IMAX clients. Most recently, Jeff has helped pioneer the use of digital twin-camera systems for native stereo 3D imaging on the feature films THE AMAZING SPIDER-MAN, THE GREAT GATSBY, and XMEN: DAYS OF FUTURE PAST. I appreciate your help with this series Jeff - thanks for helping out! What's your favorite 3D movie and why? Jeff Amaral: My pleasure Jim! I was thrilled in 2004 when I saw POLAR EXPRESS in 3D as the first IMAX feature length film. Directed by Bob Zemekis, the film is a thoughtful, adult meditation on faith in modern times, balanced with a thrilling, immersive 3D adventure for kids. That picture, a performance capture, native stereo CGI film for kids, really tried to take full advantage of the emerging language of 3D Cinema. You are transported into the world of a young boy, and embark on a quest to find out if Santa exists. A giant train arrives into your snow-filled cinema. You sink beneath the words on a page as if to get a different perspective and question what’s been written there. During the journey, you get to feel what it’s like to run with the wolves, to soar with an eagle, and hurtle toward certain doom on the top of a speeding locomotive. Fantastic. From what I’ve seen lately, the real progress in the evolution of the language of 3D Cinema is being driven forward by the independent 3D film community. For example, Wim Wenders 3D documentary PINA is an awesome contribution to the global dialogue of this medium. I truly hope that more great directors will consider exploring live action 3D for dramas and non-VFX explosion movies. I’m looking forward to seeing Wenders’ upcoming 3D drama EVERYTHING WILL BE FINE. Explain your thoughts on the native 3D vs. the 3D post-conversion debate as it stands with today's technology? JA: There isn't a debate. Native is far superior. So superior, in fact, that anyone discussing the “debate” isn’t interested in picture quality at all, nor in serving the eyes or hearts of their audience. Post Conversions are great to help fill in the gaps in the current state of native stereo cinematography, but it’s not an option for an entire live action film, GRAVITY notwithstanding. Here’s how I see it: While it may be true that a 2d picture is worth a thousand words, a 3D picture is worth a library. It’s simply more information contained in the frame, a massive amount more. Over 100 years later, I can still step into a native stereo 3D photo from China shot in 1900 like I am time-travelling; it still moves me into a deep emotional connection with the subject across a century of time. That feeling doesn’t exist with any of the current 3D post-conversion processes. 3D post Conversions are a series of paper-dolls cut out and strung together with dark fuzzy gaps in between. It’s an easy studio marketing solution to justify an up-charge, but as might be expected, the audience has already tired of such over-processed product, and it’s slowing the evolution of the language of the 3D Cinema Medium to a crawl. A. How can we let some poor VFX kid chained to a box destroy our academy award winning actress’ face for a large percentage of our global audience? B. If we can use the greater information contained in the 3D frame to reach an audience with a deeper emotional impact, a deeper understanding than we previously were able to...would filmmakers of integrity would want anything less for their audience? What do you make of the negative comments that Seamus McGarvey has made regarding 3D? JA: This is the bleeding edge of the language of storytelling, and it’s not for the faint of heart. I have such great respect for cinematographers such as Allen Daviau, Simon Duggan, Newton Thomas Sigel, and Benoit Debie who in spite of the technical challenges of native 3D shooting, were willing to dig into the medium and explore what is possible out here on the frontier. Of course I’ve also dealt with a number of older cinematographers that were downright scared about the change to digital, let alone native stereo 3D. All I can offer to them is don’t be scared, be BRAVE. You can help write the language of this rapidly evolving medium. How do you position China now on the world cinema stage now that they have ~20,000 3D screens in place and growing? JA: Reportedly there’s a billion people that have been trapped under Marxist national identity stories for a very long time. The people there are probably desperate to get as much information as quickly as possible to help them grow out of their trap. What will they do when they realize who they truly are and what will they want from the west? I have no idea, but I believe strongly that the only answer for any tyranny is education. Screening 3D large format educational films alongside movies of multi-cultural superheroes battling against tyranny and oppression may well be the best way to foster change there. For my part, the day that AI WEIWEI wants to make a 3D movie, I’m going to help make it happen. JA: I was raised in New England, and when I was 7 years old my mother gave me my first Viewmaster, brought home from a trip out to California. I started out with the 3 reel sets from the Universal Studios Backlot Tour, Knotts Berry Farm, and a collection of awesome Peanuts Cartoon dioramas. For example, the Snoopy and the Red Baron series were real model planes and puppets, shot on miniature sets and lit with strong, super-saturate colors. I’m fairly certain that they led me directly into a lifelong pursuit of theatre and cinema lighting, which grew into 3D Photography. The next thing I knew, I was living in California and making 3D movies. So I guess it’s true, I can actually blame my mother. JA: My preferred set up always starts with smart people, committed to the work. I try to hire the right team, and not get attached to which hammer they choose to use. That said, I’ve had a number of no hassle shoots with teams that were fluent with 3ality Technica gear. Are there any new stereoscopic technologies coming out in the field that has your interest? JA: Yes, but I’m really looking forward to the day that my handheld will have the power to document the entire data set of a “what if” scene that we have staged, and stream the story as we go to multiple venues around the globe. When working with optics, do you find there is disparity between how long it takes to make a 2D lens change verses a modern 3D set up? JA: There is no longer an on-set difference worth mentioning, because a good camera team is a good camera team, whether working in 2D or 3D. Forgive me for speaking plainly, but that kind of question only applies to FLAT FILMMAKERS, trying to wrap their brains around changing the way they have always done things. How long should it take to do a lens change? A better question might be ‘How many shots do you really need to tell the story correctly in 3D?’ There is such a greater emotional impact in a 3D shot that you may find that you get away with far fewer shots. Might our creative time be better spent handcrafting each frame and sculpting the performances? I realize that I might be old-fashioned, but why would I waste our precious time together with the hustle and bustle of counting how many set-ups a day we get, or getting shots that we don’t need? If you have worked with 3D conversions as a stereography adviser on set, how are the general interactions with the cinematographer and director as opposed to a native 3D production? JA: I love it! It’s like 1st contact with an alien species, or perhaps preaching to the heathen in the wilderness. A delicate dance to be sure, but most of us are great movie lovers and so far it’s been easy to find common ground. What would be your favorite shot for 3D and why? JA: I can’t wait to see Tilda Swinton in 3D, the way she creates a character’s body language is like cold water magically brought forth into the dying desert of the flatlanders. Obviously 3D has matured since the late 2000's both in technology and expertise. What credentials / experience would you mention that helps separate you from the field and brings you to the top of the industry? JA: Anyone can learn to use the gear, but it takes time to learn how to see. I bring something to the medium that very few people have, a genuine love and respect for 3D Cinema and the history that brought us here. I grew up in the theatre and then transitioned into flat cinema; For me, 3D Cinema is the ultimate marriage of those two very different worlds, and I’m an enthusiastic proponent of the best of both. If you are a lover of storytelling, and you care about how your stories affect the planet, then I want to help you reach your audience with the greatest possible emotional impact. What education would you recommend to up and coming stereographers / cinematographers in today's world? JA: Ask yourself the question, What makes a 3D image different from a 2D image? You might start looking for the answer in the US Library of Congress Stereoview archives, by screening all the films in 3D from the 1950’s onward, and by patronizing a proper Theatre. I encourage students to consider the language of 3D from the perspective of both theatrical and cinematic history. There are many things that have never been seen on-screen nor said from the stage, this is an opportunity to write yourself into the history books. Great point! Do you have a post-production software preference for working with the stereo images to do any fine tuning you need to do? JA: The tool is only as good as the operator. That said, I’ve been very impressed by both Mistika and DaVinci operators. How important is resolution? Would more pixels be more important for stereo 3D? Higher dynamic range? HFR? JA: Yes, More is better, always. More information is what we are after in the pursuit of truth in the frame. In the future, it’s silly to have something like film grain blocking me from seeing what’s really happening in the story; it’s fun and nostalgic for sure, and sometimes it can be used to great artistic success for a story, but these are exceptions not the rule. For my part, I’ll never again watch the big game on my grandfather’s tube TV. Are there any specialty filters that you find enhance the stereo images? How about specialty filters that you have found should never be used? JA: I appreciate that DP’s often come attached to their old bag of tricks, and it’s true that specialty Filters and FLAT cinematography can be spectacular, but they’re tools developed over decades for an essentially different medium. In 2014, stereo matched lenses are just becoming readily accessible, but we still have to hunt through the bins at the rental house to find an acceptably matched set of basic ND Filters. That said, if you have a great in-camera idea that enhances a story point in some unique way, let’s test it. Split focus diopters are a popular tool in 2D. Do you think a director looking for an effect like that can get that in stereo 3D? JA: Sure, but I suspect that even De Palma would agree that you shouldn’t bring a knife to a gun fight? For my part, there is a danger in framing the discussion of contemporary stereo 3D content in relation to outdated special or visual effects. It is a different medium, a different LANGUAGE, that’s not quite THEATRE nor FLAT CINEMA. There are many tools that have been created to fulfill goals in FLAT CINEMA. Why would you want to restrict the advanced storytelling capabilities of the STEREO 3D medium by saddling it with a boat anchor like split focus diopter shots? That was cutting edge 40 years ago. Don’t get me wrong, if you want to cut one into your movie as an homage to your favorite director, then by all means we’ll find the best way to do it. It’ll be fun. Open mic: What is the biggest challenge that you'd like to openly discuss about today's 3D? JA: Cutting up the movie up into a ridiculous FLAT TYRANNY of 2 second shots. It’s completely the opposite of the 3D aesthetic. The whole point of a 3D picture is that I can look at it longer, there just so much more to see. I can grok the content of a 2D image in the blink of an eye! Perhaps that’s one of the reasons why we cut so fast in 2D these days? But seriously, if Gene Kelly’s got legs, why are we cutting him up into little tiny pieces? I want to see him dance. I usually encourage Directors & Editors to watch Gene Kelly in the Three Musketeers. Well before martial arts movies, it’s a first rate example of amazing sword-fighting skill, grace and athleticism. That movie is joy of wide frames and long takes, and the opportunity to see the real guy do all this amazing stuff. I’m a true fan of Johnny Depp’s work, but I can’t even watch the pirate movies today because I can’t see the sword-fights at all through the blur of edits. Either the actors do the fighting or the pictures do it. I prefer to see the actors. Open Mic: What are you happiest about in the 3D field? JA: That there are still people out there making amazing 3D content without a thought of financial or logistical concerns. They are passionate about the stories they tell, and they have found that 3D can enhance that story’s impact. If there was one thing you could change about the industry what would it be? JA: I do wish we could move a little faster from idea to eyeballs. Proper Bio Feedback for the direction of our species is fast becoming an endangered beast, and If we intend to hold up a mirror to nature we had best get busy. What stories can be told in 3D that can’t be told via 2D? JA: My late 3D Guru, Ray Zone, in his book 3D REVOLUTION wrote “stereography presents to the storyteller an expanded narrative palette with subtler and more seductive tools to invoke belief”. I’m really interested in expanding the 3D Cinema language palette by exploring flat thinking vs. multi-dimensional thinking, and finding ways to show the difference in Z-Space. If you recall, the world used to be flat. Then some humans started thinking about the question and lo and behold the world is actually round. For example, in Zemekis’ POLAR EXPRESS, 3D makes it possible to literally sink to the opposite side of words printed on a page, when considering the opposite side of the story. That’s very interesting to me. If they ever make a movie version of WICKED, the ultimate 2D-to-3D dissolve would take place when the story of the wicked witch intersects with our well known story of Dorothy. It would reference the B&W-to-Color dissolve in the Wizard of Oz, but when we consider the wicked witch as the hero of her own story, our understanding of the original story expands beyond 2D Propaganda and into Dimensionality. That's the stuff of cinema history. There must be a proper 3D movie that’s coming, the “PLEASANTVILLE” of 2D & 3D if you will. I can’t wait to work with those kids. It’s going to be blast. Thanks so much for your time on this Jeff! We appreciate it a great deal and thank you for your work that you are doing on movies like THE GREAT GATSBY. I thoroughly enjoyed seeing the classic tale so wonderfully brought to 3D screens. Stay tuned for our next interview in the Summer Stereographer Series coming soon!